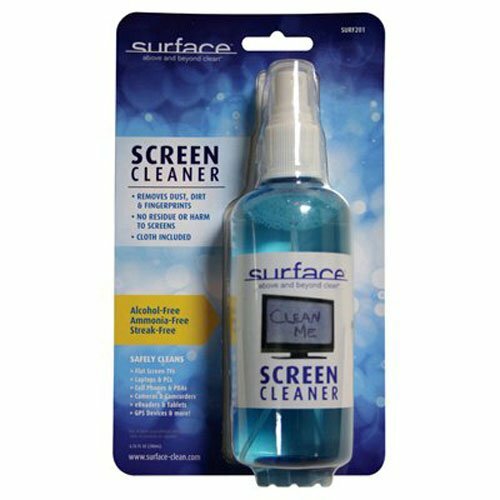 The Surface SURF201 Screen cleaner is everything you need for a safe and clean screen. This multipurpose screen cleaner removes dust, dirt and fingerprints. It Leaves no residue or harmful coating and comes with a reusable microfiber cloth. That cloth cleans without scratching and wipes away the solution to reveal a clean surface. All ingredients are alcohol-free, ammonia-free and streak-free. If you have any questions about this product by Surface Hair, contact us by completing and submitting the form below. If you are looking for a specif part number, please include it with your message.